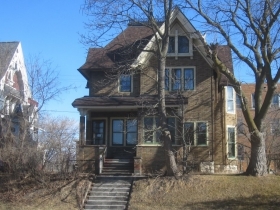 Will Historic Home Be Saved? St. Rita's development could destroy 1875 building by architect James Douglas. 1616-18 N. Van Buren St. Photo by Michael Horne. 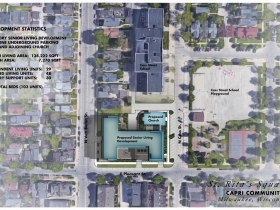 On Monday, February 12th, the Milwaukee City Plan Commission will meet to discuss three agenda items relating to a new St. Rita’s church building and a senior housing facility to be constructed by Capri Senior Communities. Change the existing zoning to a Detailed Planned Development. If approved, the alley vacation will go to the Public Works Committee, while the other measures will be considered by the Zoning, Neighborhoods & Development Committee prior to a Common Council vote. The developer’s plans call for the new construction to be built on cleared land. 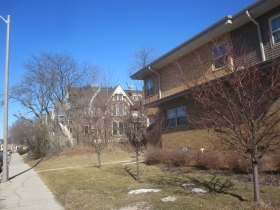 Existing structures on the site include a vacant former convent built in 1961, a school, a 1936 church building, a former rectory dating to 1956 and a large multifamily building originally built as a single family home in 1875. The convent site would provide the location for a new St. Rita’s church, a part of the Three Holy Women Roman Catholic Congregation. 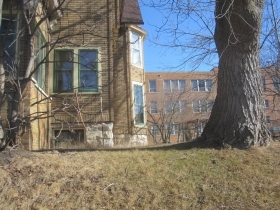 The senior housing facility would be built on the remainder, including in the vacated alley. The long-vacant convent has long been stripped of its interior, with the exception of a marble altar. The rectory was converted into four apartments in 2016. The church building, which includes vacant school rooms on the top floor, and an adjoining vacant school, is only used for religious services, including a weekly Sunday Mass. It is functionally obsolete, and is not accessible, especially for an elderly population. (The final spaghetti dinner, a custom in the church organized by Sicilians, was held in January). These buildings are not particularly distinguished, and their loss will not be nearly as lamented as that of the Little Pink Church, the original Sicilian parish of the Archdiocese of Milwaukee, which was razed for freeway construction in 1968. Artifacts from that church, now at St. Rita’s, will be incorporated into the new church building, which is designed to evoke the beloved Blessed Virgin of Pompeii edifice in the Third Ward. This leaves the remaining structure, located at 1616-18 N. Van Buren St. 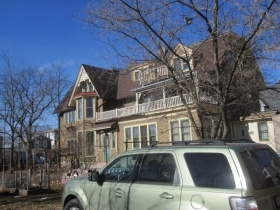 It was built at a cost of $2,000 in 1875 as a residence, and quite likely designed by architect James Douglas, who, at the same time, also built the Dr. Fisk Day Holbrook house, now a Wauwatosa landmark. At the time Van Buren St. was a favored location due to it being on a rise, above the miasmic river to the north and west, while sufficiently high enough to catch the occasional cleansing winds off Lake Michigan, located nine blocks to the east. The developer, in the initial presentation in April, 2017, had little to say about the fate of the building, concentrating instead on the reincarnation of the Blessed Virgin of Pompeii on the site of the former home of the Sisters of Charity. However, due to its age, quality, and connection to the neighborhood’s historic fabric, this home is considerably more important than the other structures that are to comprise the new building site. Yet, thus far, there have been no moves made to preserve the structure, other than a recent citywide ordinance calling for the deconstruction, rather than the demolition, of structures built before 1929. Perhaps the building merits consideration for preservation. If the building cannot be preserved at its present site, it would make sense to have it moved. This was a quality house at the time of construction and still retains many of the James Douglas features like the elaborate trim. 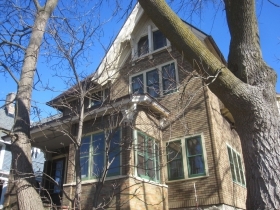 Most of the Douglas houses in this east side neighborhood have been stripped and remuddled. Just as an aside, there were 4 or 5 people who stopped us when we were photographing the … house and St. Rita’s last summer (that usually does not happen). All were unhappy about the proposed demolition and were hoping something could be done to preserve the house. By the turn of the century, the home, at what was then 782-Van Buren St., already sported an 1890 addition, which cost $1,800. This expanded the structure, on its 6,300 square foot lot, to its current 4,209 square feet of finished living area, allowing it to eventually contain six units, as it has today, according to city records. In 1916 Henry Zimmerman, the owner, had a $100 steel garage built in the rear, along the alley that is to be vacated as part of the current proposal. The structure came in crates, presumably from Sears, Roebuck & Co., and took four days in November to erect, in plenty of time for the approaching winter season. In 1919, Zimmerman paid $2,200 to “alter interior partitions and convert into a 2 family flat,” according to city permit records. By 1933 Vittorio Ossanna [1884-1965] was the owner of the place. He spent $75 to enclose the front porch, as it is seen today, and in 1934 spent $100 to enclose the rear porch of what had in the meantime become a four-unit apartment building. In 1937 the old steel garage was scrapped, replaced by a $300 concrete structure that remains, and would not be missed by even the most ardent historic preservationist. In 1941 the home was sheathed in 5/8″ Insulbrick at a cost of $1,663, thus covering up the original wooden siding, and giving us the commonplace exterior walls of the home today, while the original boards lie beneath. On June 12th, 1968, widow Teresa Ossanna sold the home for $23,000 to members of the Dentice family, operators of a sausage store a block to the west on N. Jackson St. that is now the site of Pleasant Kafe. A permit must be procured, pursuant to Subchapter 4. Section 200-24 of the Milwaukee Building and Zoning Code. However, if you decide to demolish this structure or it has burned to the ground, a demolition permit is required and can be obtained in Room 1012. The Dentice family retained ownership of this property, assessed at $378,000, and the adjacent vacant lot at 1612 N. Van Buren St., valued at $154,000, until December 11th, 2017, at which time the two properties, with a total assessed valuation of $532,300, were sold for $650,000 to St. Rita Property, LLC., which shares a Waukesha address with Capri Senior Communities, the developer. The sale was entered into the city records on February 6th. We will be disclosing all of the details about the development at the February 12th meeting. We would be happy to respond to any unanswered questions after the plan commission. 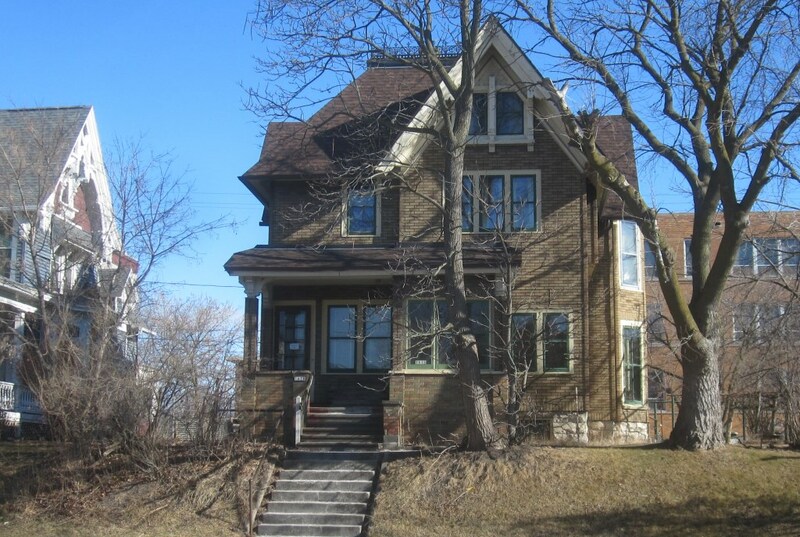 This house is architecturally significant and should be saved. Maybe someday it could be restored and lose the asphalt siding. The loss of this historic property would be tantamount to the loss of Dentice’s Italian sausage. 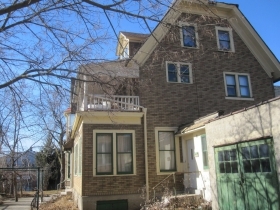 If it is indeed a Sears kit house, the proof will be stamped in the original portion of the building – look on the rafters in the attic or the floor joists in the basement. Being a proven kit house only strengthens the case for preservation. I certainly hope the house gets moved, and just fyi – Recyclean Inc out of Kenosha can do that, too! If the house was a James Douglas design, it couldnt be a Sears home. I think they were referring to the garage as possibly coming from Sears. We are losing our historic housing heritage week by week. This house should not be razed for St Rita’s expansion. There must be a way to save it. If we can spill millions on a folly like the trolley and pay a fortune to house a million dollar corporation like the Bucks, we can surely save or move one building!! !